In a previous article, I summarized the existing research on the impact of students’ use of computers in class on the quality of student learning. In this article, I discuss the results of this research, studying several options: authorizing note-taking on computers, a complete ban of the use of computers in class, implementing zones for students who do use computers, and adapting teaching styles to a timely use of computers. Each teacher can decide what option they like best. The fourth option is my personal favorite as a teacher. 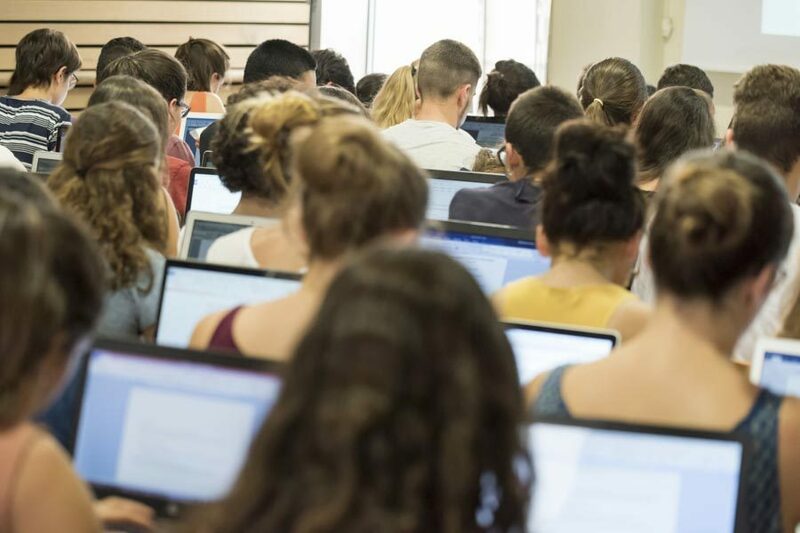 Several research papers have shown that there are downsides to letting students use computers in class to take notes (see our article on this blog that summarizes this research). However, all students are different, and the use of computers can be beneficial to some students. For example, those who do use computers to take notes say they do so for practical reasons (Aguilar-Roca, Williams & O’Dowd, 2012), for instance to facilitate the organization of the course materials. So what policy is optimal for professors to implement in class regarding students’ use of computers? Below are several policies that professors can choose from. Some professors think that computers should be authorized. They believe that it is the students’ responsibility to refrain from using social media or surfing on the internet in class. To limit the negative effects of computers, professors can explain to students how to take notes efficiently on their computers, for instance by not trying to copy word for word what is being said in class. They can also present the results of research on the use of computers in class to students, to make them aware of the negative impact of multitasking in class. Other professors prefer a complete ban. However, this option can lead to tense relations between professors and the students who want to use computers. Professors who choose this option must explain their choice to students. They can also adopt active learning strategies in class, so that students have the feeling that their professors are nonetheless attentive to their needs. Maxwell (2007) gives interesting pieces of advice from her experience teaching law courses, such as integrating new technologies in her teaching to compensate for the reduction in the use of technology by students in class. She also suggests giving more freedom to students in other parts of the class, to compensate for the authoritarian side of the ban. Intermediate solutions exist, such as creating a zone reserved for students who want to use a computer. For instance, the front rows can be reserved for students who prefer taking notes on paper. This strategy allows these students to not be distracted by other students’ computer screens, since all computers would be behind them (McCreary, 2008). Another strategy is to reserve one side of the room (for instance the right hand side of the lecture hall) for computer users, and the other side for paper users. Aguilar-Roca, Williams et O’Dowd (2012) have evaluated the impact of this strategy, by comparing students placed in a lecture hall without zones, with students placed in two separate zones of a different lecture hall (one reserved for computer users, the other for paper users), for different sections of the same large introductory biology course. The researchers found that students in the zones with computers tended to be more distracted than the students using computers without zones (that is, when students are free to sit wherever they want). This result suggests that neighbors can influence each other: computer users sitting next to other computer users seem to encourage more distractions for these students. The researchers also found that the students taking notes on paper tend to perform similarly, whether they are in a specific zone or mixed with the computer-using students. Although the separation does not improve their results, a majority of the paper-using students say that the appreciate not being mixed with the other students, stating that they are not distracted by their neighbor’s computer. Students who take notes on paper may need to spend more time outside of class to learn the course content to compensate for the loss of attention in class caused by their neighbors with computers (this hypothesis was not tested however). Finally, the researchers find that the students who take notes on paper tend to perform better on exams than students who take notes on computers. Given the design of the study, this result does not necessarily imply a causal relationship between the way notes are taken (computer vs. paper) and quality of learning. Indeed, it might be that the students who prefer taking notes on computers have different characteristics from the students who prefer taking notes on paper. Professors can try to anticipate and target the moments in class when students are more likely to yield to the temptation of going on the internet. Boredom is one of the reasons why students go on social media during class (Flanigan & Babchuk, 2015). Not understanding some parts of the lecture may also discourage students from pursuing their efforts, leading them to reduce their attention in class. Professors who include active learning methods in their teaching strategies may reduce both student boredom and lack of understanding. Finally, professors can choose to authorize computers in class, but ban them temporarily, for instance when they believe that a given section of the lecture is fundamental to understanding the rest of the course. Aguilar-Roca, N. M., Williams, A. E., & O’Dowd, D. K. (2012). The impact of laptop-free zones on student performance and attitudes in large lectures. Computers & Education, 59(4), 1300-1308. Flanigan, A. E., & Babchuk, W. A. (2015). Social media as academic quicksand: A phenomenological study of student experiences in and out of the classroom. Learning and Individual differences, 44, 40-45. Maxwell, N. G. (2007). From Facebook to Folsom Prison Blues: How banning laptops in the classroom made me a better law school teacher. Richmond Journal of Law & Technology, 14(2), 1-43. McCreary, J. R. (2008). The laptop-free zone. Valparaiso University Law Review, 43, 989-1044.